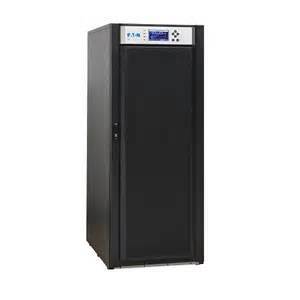 The Eaton 93E UPS delivers 20 to 60 KVA of superior power protection in a compact tower designed for today's space-constrained data centers. Three key features facilitate a lower total cost of ownership (TCO) - energy efficiency, internal batteries, and a small footprint. Eaton 9E 20 and 30KVA single feed 3 breaker side car maintenance bypass, hardwired input and output 208v. Eaton 9E 20 and 30KVA side car 3 breaker maintenance bypass, left side single feed, hardwired input and output 208v. Eaton 93E 20 and 30KVA dual feed right side 3 breaker side car maintenance bypass, hardwired input and output 208v. Eaton 93E 20 and 30KVA dual feed left side 4 breaker side car maintenance bypass, hardwired input and output 208v. Eaton 93E 40 and 60KVA single feed left side 3 breaker side car maintenance bypass, hardwired input and output 208v. Eaton 93E 40 and 60KVA single feed right side 3 breaker side car maintenance bypass, hardwired input and output 208v.